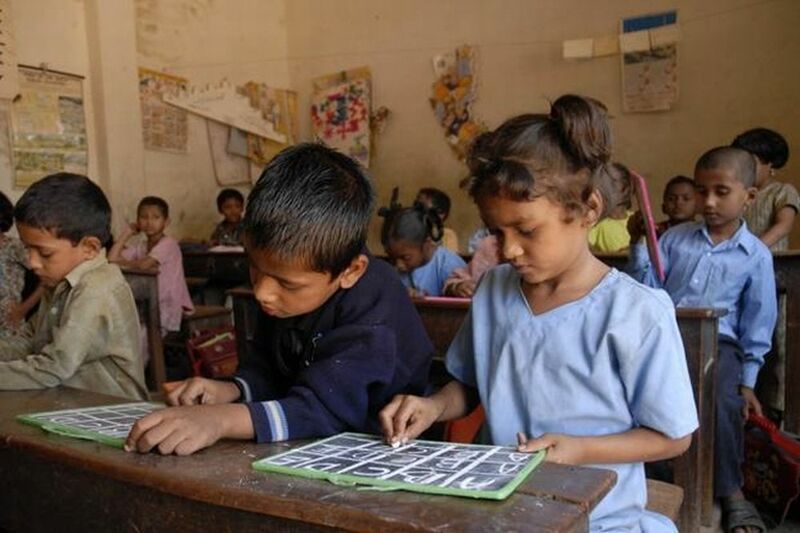 The Annual Status of Education Report or ASER is a comprehensive yearly ritual constituted to ascertain the efficacy of the Indian School education system. The ASER attempts to capture the effectiveness of the learning outcomes of the students under its care on a pan India basis. ASER 2017 is a sample based household survey, requiring simple-to-administer and easy to understand set of direct questions. Therefore one cannot argue that it was anything other than basic or elementary questionnaire. For the survey to possess a high degree of reliability and truthfulness it should have no ambiguity at any stage. ASER first started in the year 2005 and the twelfth annual report has been tabled in January this year. The ASER is a true and an independent barometer of the learning levels of students in the age group of 5 to 16, including those covered under the RTE act 2009. Only this year the survey has been broad based taking into consideration the students in the age group of 14 to 18 years. 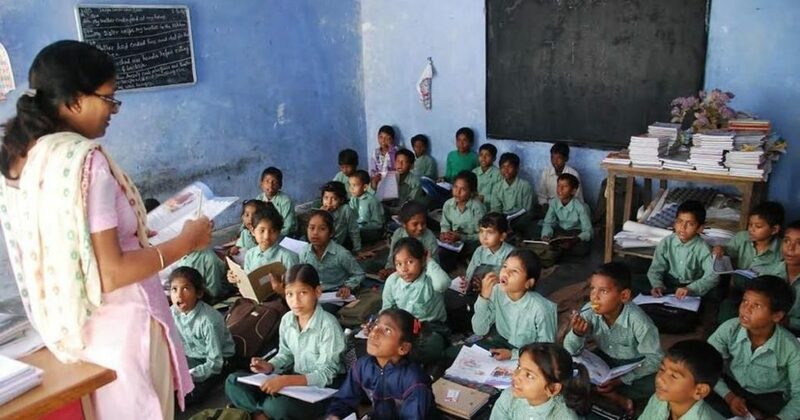 According to official figures of District Information System for Education (DISE), enrollment in class 8 has almost doubled in the period from 2004-5 to 2014-15, up from 11 million to almost 22 million. As per the 2011 census data, one out of every ten Indians or 10 % of the country’s population is currently in the age group of 14 to 18. Using this piece of information, we can confidently say that there are 125 million or 12.5 crore youth in the country and this is the reason why ASER 2017 considered this particular age group. Another reason why this age group was picked, I believe, is the fact that in this age group children acquire new skills and get ready for seeking employment. For the first time ever, the 2017 ASER report has attempted to explore a wider set of parameters beyond foundational skills like reading and arithmetic, which are activity, ability, awareness and aspirations among the students surveyed. The study was conducted in one or two districts in almost all states of the country and therefore it was truly representative of the entire country. The scope of the survey was quite comprehensive as it covered a total of 28 districts of 24 states. A total of 25,000 households in 1,641 villages participated in the survey and more than 30,000 kids in the 14 to 18 year of age were spoken to. This painstaking exercise attempted to bring to the fore the inconsistencies of our education system from the point of view of the learning outcomes of children those supposed to benefit from it. Year after year, ASER continues to highlight the fact that although almost all children are enrolled in school but they are not acquiring basic foundational skills like reading ability and basic arithmetic operations that can help them make progress in school and thereafter. About 25% of students cannot read basic text fluently in their own language. More than half struggle with simple ‘3 digit by 1 digit’ division problems. 47% of all 14 year-old in the sample cannot read English sentences. The reading and learning disability in the lower age seems to carry forward through into the higher age. These figures are hard to digest but true and delineate in absolutely certain terms the ills that beset and besiege our education system. In spite of huge budgetary spending and that too for an extended period of time, why have the learning levels not improved, remains an unsolved puzzle? The reality is hard to miss and stares squarely in our faces. We need to dissect the finer points of the report. There is one big silver lining that stands out conspicuously. The report tells us that the enrollment ratio in the age group of 5 to 16 is close to 100 %. This means that almost all the children in this age group are in school which is a positive sign. However, in the age group of 14 to 18, the enrollment ratio is 86 % only. The rest 14 % students seem to have quit the formal education and are no longer going to either school or college. A disturbing trend of many years is the percentage of youth not enrolled in either school or college. This percentage increases with age. At 14 years of age, the percentage of youth not enrolled is reported to be 5% and by the age of 18 this figure increases to 30%. This confirms that youth take up informal employment including informal and self-employment. Now let us see the difference in figures for each gender separately. The enrollment gap between boys and girls in the formal education system widens with increasing age. The difference between the genders is not perceptible at the age of 14 which is approximately the same. 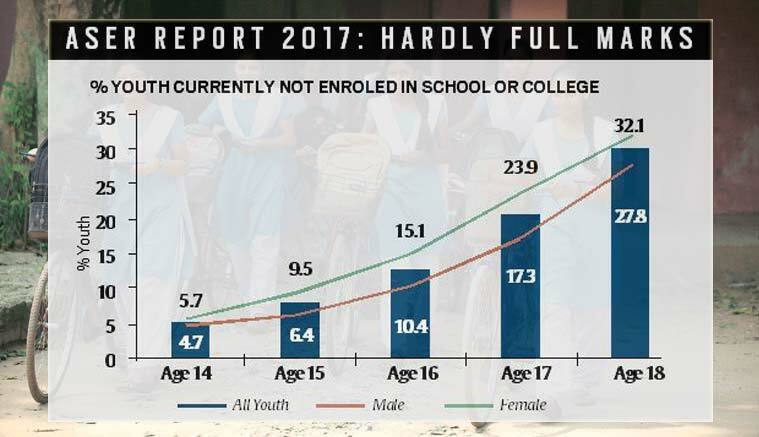 However at age of 18 years the difference is stark, 32% girls are not enrolled for higher education as compared to 28% boys. Could this be the reason why the plight of girls continues to be pathetic as they are out of school or college? It is said that when you educate a girl, you educate a family, a community and a country. This is where we as a society have to direct our efforts to change the trend by starting a mass movement aimed at enrolling as many girls as well as back into school or colleges. Recall how our PM Narendra Modi harbors high expectations from the youth of the country, those in the age group of 18 to 35. He talks about the need to inculcate professional skills among the youth if India is to reap commensurate demographic dividend. He nudges the youth to enhance and acquire skills so as to become professionally employable. Having a graduation degree is not sufficient to secure a job but relevant skills are. This is where the programs of skill India come into focus that can empower the youth of the country. There are about 32 skills that have been identified and enrolling in these short term training programs gives the youth the much needed fuel to seek employment. Now let us see what does the ASER report tells us about skill development among the youth. After so much noise about it the reality is that only 5% of the youth take up some kind of a program to enhance their skills. This figure includes all youth whether enrolled in school or college as well as those who are not. Most the youth prefer a short term course of less than 6 months duration. A substantial proportion 42 % of youth in the 14 to 18 age group are employed, predominantly in the informal sector. Out of this, about 80 % work in agriculture sector on their family owned farms or do household chores. Even if the youth, girls as well as boys, leave formal education but still they can succeed in life by receiving professional training under the skill India program to take up meaningful employment. Can we offer choice to class 10 students to take up skill India programs to choose their profession quite early? Why should all study history, geography, physics or maths? I see this as a big challenge where a lot needs to be done. This is where the society should get together and form a strong opinion about getting all the youth back into school or college or a vocational training school. Consequently, there are numerous opportunities as majority of the work is undone. In my opinion the skilling project is still in its infancy and is yet to take off in a meaningful manner where close to 100 percent those seeking employment necessarily take up relevant courses to upgrade their domain knowledge and acquire professional skills to become more effective in their jobs. I have spoken to so many youth during the course of this article but few seem eager to enhance their skills and were disinclined to enroll. However, they wished to lead a prosperous life and earn a big fat salary packet. With a little motivation and slight push, enrollment might not be an issue. Now, it is up to the family and the society to put their weight behind the social movement required to change the fate of our youth and the country.